The United States will not play at the 2018 World Cup. Taylor Twellman was not impressed. THE UNITED STATES will not compete in the 2018 World Cup after being shockingly eliminated from qualification with an embarrassing 2-1 loss to Trinidad & Tobago. It will be the first World Cup the United States will not participate in since 1986. After the match, veteran soccer writer Grant Wahl summed up the enormity of the disaster best. But maybe the best comments came from former national team member and current ESPN analyst Taylor Twellman, who went off on the state of the U.S. Men’s National Team. 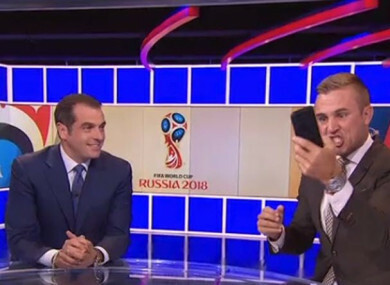 When co-host Max Bretos said this loss would cause “the gloves to come off” and shake up the program, Twellman pointed out that should have already happened. Earlier, Twellman went off on U.S. Soccer’s inability to get the men’s team ready for this qualification tournament. Twellman did not stop at blaming U.S. Soccer, saying a lot of the blame is on the shoulders of the players. Email “'Belgium played Bosnia on a cow pasture' - former player has no time for US excuses”. Feedback on “'Belgium played Bosnia on a cow pasture' - former player has no time for US excuses”.